I know, I know...this post is so long overdue! That wasn't my intention, but life has been spinning (and doing tricks) at 100 miles per hour since I got back from Portugal. Travel posts take time, attention to detail, and a lot of focus, which I haven't had, so it was important to me to make sure I could write something that honored my time in Portugal in the way that it should be. As a heads up, these posts are going to be a bit long, so I'm going to break them up into parts. This post, Part 1, will focus on the time I spent in Algarve and the surrounding areas. I'll post the rest about a week apart. tl;dr: I had an AMAZING time! There are pretty pics below plus hotel and food recommendations, so please scroll. Take. Me. Back. 😫 Portugal was absolutely amazing. What a gorgeous, breathtaking country. The weather was perfect, the food was fresh and delicious, the people were warm, welcoming, and so helpful, and last but certainly not least, I was in the company of true friends. What more could a girl ask for?! We started off in Algarve and ended the trip in Lisbon, which I would totally recommend. While I had a ton of fun in Lisbon, the beaches stole the show. I guess that's what happens when you live in New York City. Sometimes you need to get away and pretend concrete isn't a real thing. What's funny is that we had been planning this trip for months, since the beginning of the year actually. I hadn't heard or seen tons of people heading to Portugal but it seems to be the hot new travel destination, the new Iceland if you will. There's nothing wrong with that because it's insanely underrated and a must see, but what this does mean is that prices are bound to go up, so do your research if you're thinking about visiting. I'm going to break down each location with the places we stayed, visited, and ate (if they were noteworthy). 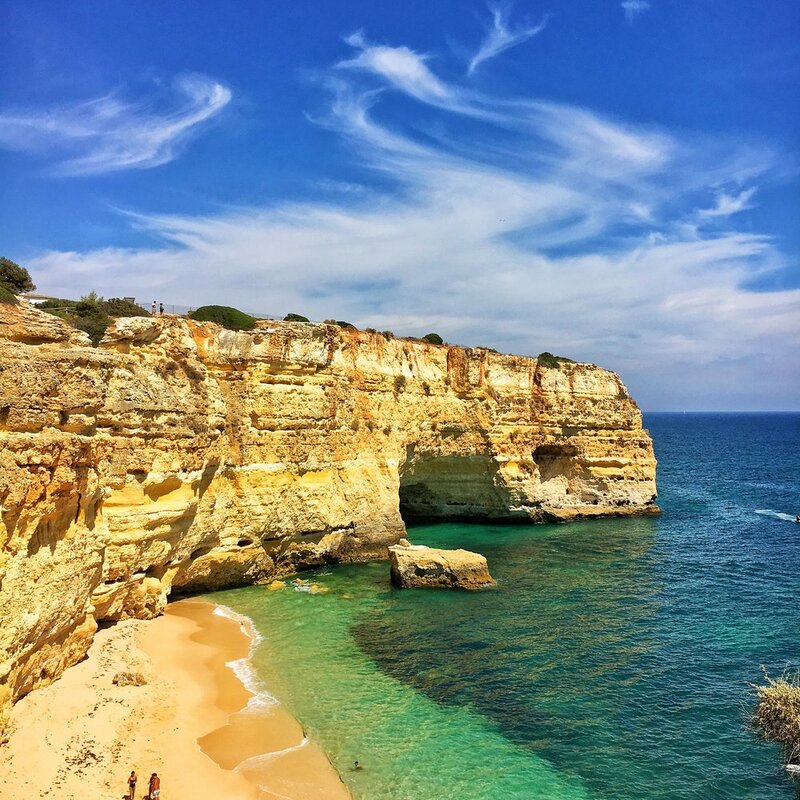 In terms of budget, we indulged, so if you're looking to do Portugal on a dime, it's totally possible, but this post may not be the most helpful. Portugal in general however, is very very affordable, for the most part. I love a great travel deal like the next person, and I definitely make sure I'm getting my money's worth, but once I'm actually on vacation everything kind of gets thrown out the window. What's the point?! Relax, let loose, life is meant to be enjoyed! We stayed in Portimã0, an area in Algarve, at a stunning 5-star boutique hotel called Bela Vista that sat right on the beach. We were greeted with native wine at check-in, had an exquisite breakfast spread each morning and gorgeous ocean views. It was important to all of us to see all that we could, without making our time too exhausting. Thankfully, both of my girlfriends are amazing at building travel itineraries and searching for must-see locations and attractions. In our days there, we visited Praia de Benagil and the caves, Praia de Marinha, Senhora da Rocha, and Ponte de Piedade. Protip: You'll need a taxi to get to all of these locations which can be a little tricky. Getting there from your hotel isn't much of the issue. It's more so getting back and from place to place. The language barrier can make it hard, but learning basic words will help immensely. Before leaving your hotel get phone numbers for taxi services and when you do get in the taxi see if you can schedule a pick up from your location. This goes without saying when traveling abroad, but if you're like me and never carry cash (sorry, Dad! ), CASH IS KING. I repeat, this is an Uber-free zone. Taxis aren't expensive at all by the way. There is always the option to rent a car, but most of the rental cars are manual which may not be ideal if you aren't familiar. One of my favorite parts of the trip was the cave tour that we took. I'm sure that you're able to put in reservations at most of the beaches in the area, but ours was out of Praia de Benagil. It's important to go when it's low tide. These tours also book up pretty quickly so if you're interested in going, check in with your hotel once you arrive. I believe it was about 15 Euros per person, so very affordable. The caves are stunning. Like, how is this our world? Every time I think I've seen something beautiful God is just like "JK.". The most spectacular thing that we did in Algarve was visit Ponte de Piedade. We heard that the views were stunning at sunrise so we were in a cab at 5AM chasing the sun. It was such a special moment to share with two of my best friends on this planet and its something that I'll never forget. Ok - last thing (and best thing), I promise. Other than at our hotel, these were the most noteworthy restaurants. The food in both locations were so fresh, cooked to perfection, and perfectly seasoned. The staff was also so sweet! We had some delicious churros at a random stand that I don't know the name of, but they were giant and stuffed with Nutella. If dessert calls you from the streets, just stop. I promise it will be worth it. Enjoy and please let me know if you're looking to go to Portugal, I have tons of info that will make it a really special trip. Keep an eye out for Part 2 of this post, with everything you'll need to know about Lisbon.